If you're all about relaxed dressing when it comes to fashion, you'll love this cute pairing of a black blazer and a Gucci leather belt with interlocking g buckle. Up the cool of your outfit by completing it with black leather heeled sandals. If you're all about feeling relaxed when it comes to dressing up, this combination of a charcoal coat and a Gucci leather belt with interlocking g buckle is totally for you. Why not introduce black leather heeled sandals to the mix for an added touch of style? If you're obsessed with functionality dressing when it comes to your personal style, you'll love this chic combo of a black and white polka dot crew-neck t-shirt and a Gucci leather belt with interlocking g buckle. If you're a fan of functionality dressing when it comes to your personal style, you'll love this adorable combo of a red leather biker jacket and a Gucci leather belt with interlocking g buckle from farfetch.com. Up the cool of your outfit by completing it with black suede over the knee boots. If you're all about relaxed dressing when it comes to your personal style, you'll love this totally chic pairing of a black blazer and a Gucci leather belt with interlocking g buckle. When it comes to footwear, this ensemble is finished off nicely with brown leopard suede driving shoes. If you're a fan of relaxed dressing when it comes to fashion, you'll love this super cute pairing of a multi colored horizontal striped turtleneck and a Gucci leather belt with interlocking g buckle. Got bored with this ensemble? Enter black leather ankle boots to jazz things up. 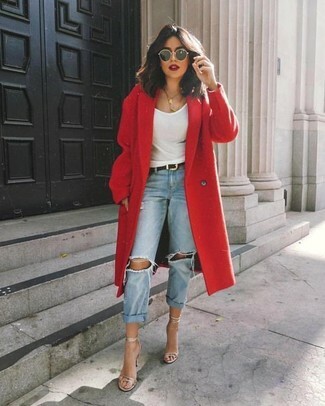 If you're all about relaxed dressing when it comes to fashion, you'll love this extra adorable pairing of a red coat and a black leather belt. To add oomph to your ensemble, round off with silver leather heeled sandals. If you're all about relaxed dressing when it comes to your personal style, you'll love this extra cute pairing of a beige trenchcoat and a Gucci leather belt with interlocking g buckle. Make beige leather pumps your footwear choice to instantly up the chic factor of any outfit. Team a red pleated casual dress with a Gucci leather belt with interlocking g buckle from farfetch.com, if you feel like relaxed dressing without looking like you don't care. And if you want to instantly kick up the style of your look with one piece, add black leather ankle boots to the mix.